“This agreement basically assumes that we are all grown-ups and will act as such. You are responsible for anything you express, say, do, or decide. All information provided on InfidelityCPR.com, and/or EmotionalSex.com, ChattingorCheating.com and through any link or channel is provided as-is with no warranty or guarantee of any kind. “InfidelityCPR.com” owns and retains all proprietary rights in the Website. The “Website” refers to the “ChattingorCheating.com and/or EmotionalSex.com “ websites, in addition to all materials sourced on website and distributed through other channels. It also includes all EmotionalSex.com and/or ChattingorCheating.com and/or EmotionalSex.com video segments produced and distributed through YouTube, Video Jug, and any other video distribution partnerships. The Website contains the copyrighted material, trademarks, and other proprietary information of ChattingorCheating.com and/or EmotionalSex.com and/or InfidelityCPR.com and its licensors. Except for that information which is in the public domain or for which you have been given written permission, you may not copy, modify, publish, transmit, distribute, perform, display, or sell any such proprietary information. You may not post, distribute, or reproduce in any way any copyrighted material, trademarks, or other proprietary information without obtaining the prior written consent of the owner of such proprietary rights. Without limiting the foregoing, if you believe that your work has been copied and posted on the Service in a way that constitutes copyright infringement, please provide InfidelityCPR.com and/orChattingorCheating.com and/or EmotionalSex.com with the following information: an electronic or physical signature of the person authorized to act on behalf of the owner of the copyright interest; a description of the copyrighted work that you claim has been infringed; a description of where the material that you claim is infringing is located on the Website; your address, telephone number, and email address; a written statement by you that you have a good faith belief that the disputed use is not authorized by the copyright owner, its agent, or the law; a statement by you, made under penalty of perjury, that the above information in your notice is accurate and that you are the copyright owner or authorized to act on the copyright owner’s behalf. The Service contains information which is proprietary to InfidelityCPR.com and/or ChattingorCheating.com and/or EmotionalSex.com and its owners. InfidelityCPR.com and/or ChattingorCheating.com and/or EmotionalSex.com asserts full copyright protection on the Website. Information posted by InfidelityCPR.com and/or ChattingorCheating.com and/or EmotionalSex.com or it owners may be protected whether or not it is identified as proprietary to InfidelityCPR.com and/or ChattingorCheating.com and/or EmotionalSex.com or to its owners. You agree not to modify, copy or distribute any such information in any manner whatsoever without having first received the express permission of the owner of such information. Any information provided on this site is done so in full accordance with the terms and policies of InfidelityCPR.com and/or ChattingorCheating.com and/or EmotionalSex.com. First and foremost, you confirm that you are 18 years of age or older, as required by the age of maturity in your respective jurisdiction. By submitting a question or comment to InfidelityCPR.com and/or ChattingorCheating.com and/or EmotionalSex.com you relinquish any rights of ownership of your question and agree that we can rephrase, reword, modify, correct or repurpose your material without limitation or constraint. It is not our intention to mislead or misapply your question, but to give us the freedom to rephrase or reword a question to be as applicable and helpful to as many people as possible. Submitting any information to InfidelityCPR.com and/or ChattingorCheating.com and/or EmotionalSex.com and/or this site by any method including email and on-site form submission confirms your agreement to these terms. In addition, all material submitted to this site becomes the property of InfidelityCPR.com and/or ChattingorCheating.com and/or EmotionalSex.com and its owners. By providing this information, you agree to grant a full and irrevocable, non-exclusive, royalty free, and transferable license to InfidelityCPR.com and/or ChattingorCheating.com and/or EmotionalSex.com and its owners. Remember- you and only you are completely and fully responsible for your own actions. While efforts are made to provide good quality advice and information on this site, the authors make no warranty whatsoever as to the accuracy of the information. Since comprehensive psychological advice and/or diagnosis cannot be achieved outside of direct personal consultation with a licensed medical or mental health practitioner, any advice, information, quiz or test results, and/or communication of any kind provided on InfidelityCPR.com and/or ChattingorCheating.com and/or EmotionalSex.com is meant for entertainment purposes only. This site is NOT designed to dispense professional or comprehensive medical or mental health advice, treatment, or diagnosis. If you require professional help, please consult a licensed professional. InfidelityCPR.com and/orChattingorCheating.com and/or EmotionalSex.com is not responsible for any incorrect or inaccurate Content posted on the Website, whether caused by users of the Website or by any of the equipment or programming associated with or utilized on the Website InfidelityCPR.com and/or ChattingorCheating.com and/or EmotionalSex.com is not responsible for the conduct, whether online or offline, of any user of the WebsiteInfidelityCPR.com and/or ChattingorCheating.com and/or EmotionalSex.com assumes no responsibility for any error, omission, interruption, deletion, defect, delay in operation or transmission, communications line failure, theft or destruction or unauthorized access to, or alteration of, user communications. InfidelityCPR.com and/or EmotionalSex.com is not responsible for any problems or technical malfunction of any telephone network or lines, computer online systems, servers or providers, computer equipment, software, failure of email or players on account of technical problems or traffic congestion on the Internet or at any Website or combination thereof, including injury or damage to users or to any other person’s computer related to or resulting from participating or downloading materials in connection with the Web and/or in connection with the Service. InfidelityCPR.com and/or ChattingorCheating.com and/or EmotionalSex.com is not responsible for any damages resulting from any viruses, worms, “Trojan horses” or other destructive software or materials. Under no circumstances will InfidelityCPR.com and/or ChattingorCheating.com and/or EmotionalSex.combe responsible for any loss or damage, including personal injury or death, resulting from anyone’s use of the Website or the Service, any Content posted on the Website or any interactions between users of the Website, whether online or offline. The Website is provided on an “AS-IS” basis. Where permitted by law, you acknowledge that the information on the Website is provided without any warranties of any kind whatsoever, either express or implied, and InfidelityCPR.com and/or ChattingorCheating.com and/or EmotionalSex.comexpressly disclaims any warranty of fitness for a particular purpose or non-infringement. You acknowledge that use of Website is at your own risk. InfidelityCPR.com and/or ChattingorCheating.com and/or EmotionalSex.com does not represent or endorse the accuracy or reliability of any advice, opinion, statement or other information displayed, uploaded or distributed through the Website or any user of the Website or any other person or entity. 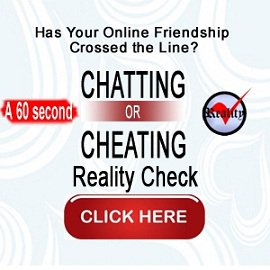 You acknowledge that any reliance upon any such opinion, advice, statement or information shall be at your sole riskInfidelityCPR.com and/or ChattingorCheating.com and/or EmotionalSex.com cannot guarantee that anyone will communicate with or respond to you from use of the Website and InfidelityCPR.com and/or ChattingorCheating.com and/or EmotionalSex.com does not promise any specific results from use of the Website. Except in jurisdictions where such provisions are restricted, in no event will InfidelityCPR.com and/or ChattingorCheating.com and/or EmotionalSex.com (or any InfidelityCPR.com and/or ChattingorCheating.com and/or EmotionalSex.com partners or contributors) be liable to you or any third person for any indirect, consequential, exemplary, incidental, special or punitive damages, including also lost profits arising from your use of the Web site, even if InfidelityCPR.com and/or ChattingorCheating.com and/or EmotionalSex.comhas been advised of the possibility of such damages. Notwithstanding anything to the contrary contained hereinInfidelityCPR.com and/or ChattingorCheating.com and/or EmotionalSex.com liability to you for any cause whatsoever, and regardless of the form of the action, will at all times be limited to the amount of purchase paid, if any, by you to InfidelityCPR.com and/or ChattingorCheating.com and/or EmotionalSex.com. The content on InfidelityCPR.com and/or ChattingorCheating.com and/or EmotionalSex.com (or other InfidelityCPR.com and/or ChattingorCheating.com and/or EmotionalSex.comarticles and/or videos accessed through alternate means such as our videos hosted on YouTube, Video Jug, etc.) is provided free of charge to InfidelityCPR.com and/or ChattingorCheating.com and/or EmotionalSex.comvisitors, readers, and viewers. Creating and providing such high quality content and providing it freely to our viewers on an ongoing basis costs time and money, but we are able to offer this to our readers and viewers at no cost through the generous support of our partners, sponsors, affiliate partners, and advertisers. Whenever possible, any product or service referred to from InfidelityCPR.com and/or ChattingorCheating.com and/or EmotionalSex.comis linked to by way of an affiliate link. Such affiliate links are used in call cases where possible and feasible to do so, regardless of whether the product / service is recommended highly or recommended against, meaning that the use of an affiliate link does not in any way imply endorsement or lack recommendation against any particular product. Products reviewed on the Website or through Videos are in most cases willingly provided at no cost by the manufacturers/distributors themselves so they may be reviewed for the InfidelityCPR.com and/or ChattingorCheating.com and/or EmotionalSex.com audience, both on the website and through any video or other distribution channels. Also, whenever possible, any company whose product or service is featured in an article or video will reimburse InfidelityCPR.com and/or ChattingorCheating.com and/or EmotionalSex.comfor reasonable production, editing, and publishing costs incurred in publishing such segment, as specified by InfidelityCPR.com and/or ChattingorCheating.com and/or EmotionalSex.comstaff, in order to help with us keep providing all this information freely to the InfidelityCPR.com and/or ChattingorCheating.com and/or EmotionalSex.com readers and viewers. The editorial integrity policy ofInfidelityCPR.com and/or ChattingorCheating.com and/or EmotionalSex.comdictates that any product recommended by InfidelityCPR.com and/or ChattingorCheating.com and/or EmotionalSex.commust be of a quality and usefulness we deem high enough to warrant recommendation to our valued readers and viewers. As such, and in keeping with the overall positive tone of InfidelityCPR.com and/or ChattingorCheating.com and/or EmotionalSex.com we generally focus strictly on positive reviews, and choose not to publish reviews of products we do not like. There are however exceptions to this rule of thumb in some areas, such as a comprehensive reviews directory. Software from this Website (”Software”) is further subject to United States export controls. No Software may be downloaded from the Website or otherwise exported or re-exported (i) into (or to a national or resident of) Cuba, Iraq, Libya, North Korea, Iran, Syria, or any other Country to which the U.S. has embargoed goods; or (ii) to anyone on the U.S. Treasury Department’s list of Specially Designated Nationals or the U.S. Commerce Department’s Table of Deny Orders. By downloading or using the Software, you represent and warrant that you are not located in, under the control of, or a national or resident of any such country or on any such list. If there is any dispute about or involving the Website, by using the Website, you agree that the dispute will be governed by the laws of the State of California without regard to its conflict of law provisions. You agree to personal jurisdiction by and venue in the state and federal courts of the State of California. You agree to indemnify and InfidelityCPR.com and/or ChattingorCheating.com and/or EmotionalSex.comits affiliates, officers, directors, employees and agents, harmless from any loss, liability, claim, or demand, including reasonable attorney’s fees, made by any third party due to or arising out of your use of the Website in violation of this Agreement and/or arising from a breach of this Agreement and/or any breach of your representations and warranties set forth above. This Agreement, accepted upon use of the Website contains the entire agreement between you and InfidelityCPR.com and/or ChattingorCheating.com and/or EmotionalSex.comregarding the use of the Website. If any provision of this Agreement is held invalid, the remainder of this Agreement shall continue in full force and effect InfidelityCPR.com and/or ChattingorCheating.com and/or EmotionalSex.com may modify this Agreement from time to time without Notification. Changes in this Agreement will be posted on the Service. If you do not agree to any modifications, you should terminate your use of the Website. Your continued use of the Website now, or following the posting of any changes in this Agreement, will constitute a binding acceptance by you of this Agreement, or any subsequent modifications. Please contact us at “contact@chattingorcheating.com ”with any questions regarding this agreement. 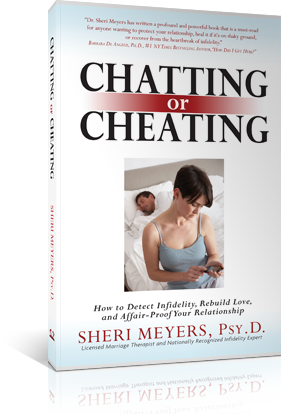 After Infidelity - Can a Marriage Be Saved? Dr. Sheri on CBS's "The Couch"
Robert Pattinson and Kristen Stewart vs. Rihanna and Chris Brown: Which Couple Will Last?